Build update: the walls are up and the roof is on. Now does it look like a house? Personally, this is my favourite part of a build. There’s something really satisfying about being able to stand inside and walk around, imagining where things will be. The framing is all secured with hurricane ties for maximum stability, not so much for windy weather but more for the force of the wind when it’s being towed behind a vehicle. 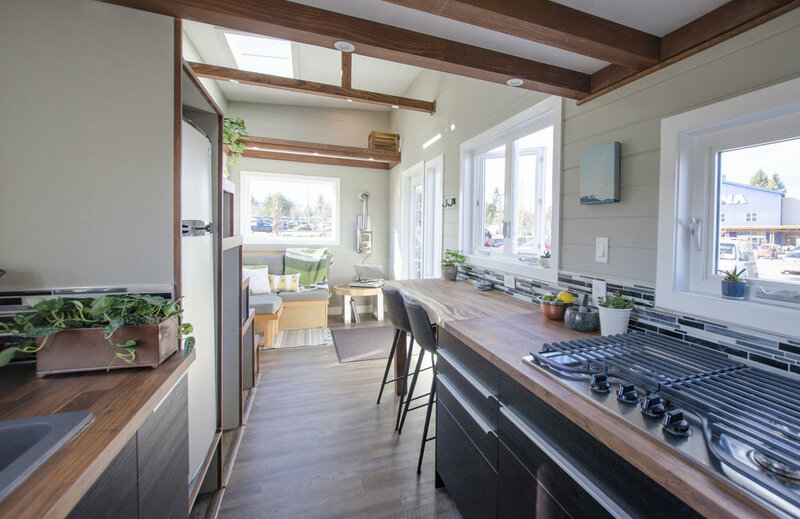 If you’re considering building your own tiny home, please don’t hesitate to get in touch with us! 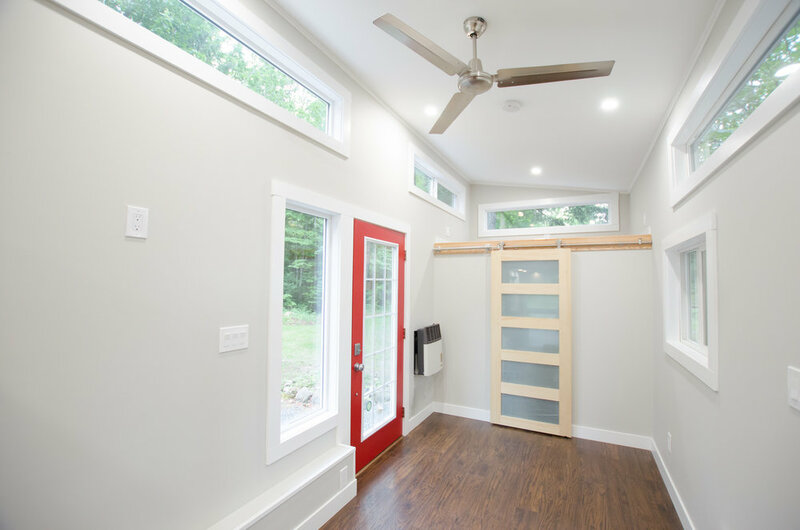 We know that a lot of people who are interested in tiny living are the DIY type – but for the sake of safety, quality, and longevity, make sure that you have someone who is versed in construction to talk to. A lot more goes into building a home (tiny or not!) than most people realize. We are more than happy to answer any questions you might have about building your own, or we can supply you with a custom proper trailer with or without a floor package or even a shell built onto it. We are in the process of writing a “Do-It-Yourself Guide to Building and Living Tiny” with all the lessons, tips, and tidbits that we’ve learned during our builds, along with advice and resources on downsizing and living more sustainably, which will hopefully be available by the end of the year. Up next: wrapping the house with home wrap and installing windows and doors. Build update: floor package and insulating. The floor package is shaping up. First we wrapped the underside of the floor with waterproof house wrap, then we started framing in the floor. We leave 2.5″ of airspace and then fasten down pieces of 3″ thick R12 rigid insulation covering the entire floor. Each piece is taped and sealed to prevent any moisture from penetrating. A new build begins: getting the trailer and starting the floor package. Yesterday we picked up our custom trailer to start our next build. 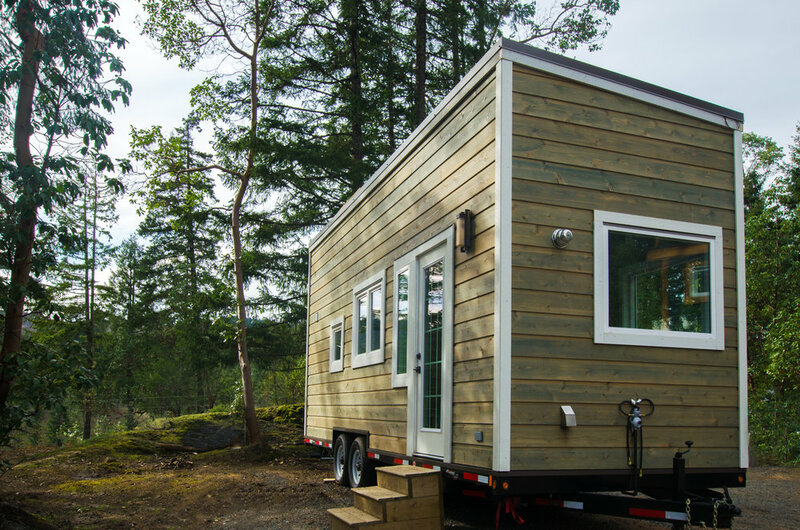 All of our trailers are built in Canada, modified on Vancouver Island, and designed specifically for Rewild Homes. There were a few modifications still to be finished when we arrived yesterday to pick up the trailer, so our lead builder Brad got his hands dirty and helped finish the job. Our lead builder Brad putting some finishing touches on the trailer. Once we got the trailer back to our job site, the first step was to remove the decking. This allows us a few extra inches of vertical space when building. The trailer is done and back at the job site! The additional flanges along the sides of the trailer allow us to build to the maximum allowable width. For extra protection on the underside, we use pressure treated plywood and then paint it with marine grade water sealant paint. Especially when building for a climate like Vancouver Island, we make sure to go above and beyond so that there will be no water leakage. Sealing the bottom of the house with marine grade water sealant paint. Up next: finishing the floor package and starting framing. See you tomorrow!